Ink Signatures enable you to capture the hand-written signatures in your web form users and to save these with their form submissions. What Do Ink Signatures Look Like? Ink Signatures differs from digital signatures since the end user signs something cryptographically. Use of digital signatures requires special software and requires that the end user have this software and the capability to encrypt content. There's a significant technical and conceptual barrier to the use of digital signatures with website forms. For these and other reasons, using a checkbox as a digital signature, while simple, is not recommended in places where you need stronger proof of identity! Is a "Click Here to Agree?" checkbox really legally binding? Case in Point: If someone buys something from you and pays with a credit card, and you don't have a written signature from them authorizing this, then you have no defense if they "charge back" the money. With their written signature, you can prove who ordered it and stop the charge back. Drawing it with a finger or stylus on an iPad, iPhone, or Android-based device. When the writer submits the form, you get this signature as a digital image. Experience in running example pages included with the ExploreCanvas library show that IE's rendering of canvas elements is very slow and resource-heavy, so the experience is not ideal for those using old versions of Internet Explorer — but at least it works. Mobile devices: Users sign by drawing their signature using a stylus or their finger. Desktop/Laptop devices: Users sign by drawing with the mouse (click and drag to draw) or by using a stylus and drawing pad. Storable: You can save the signature image in WebAidesTM, on FTP/SFTP sites, and/or in email messagese. 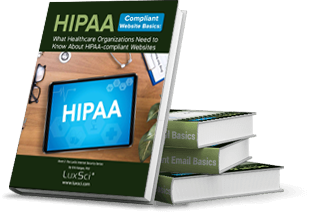 Since we started using LuxSci SecureForms, we were finally able to let our clients to sign up through our website and stay HIPAA-compliant. It is awesome how much you get for such a low price. WebAides and SecureSend are included and allow us to easily let our partner physicians send us information securely without the hassle of setting up and training everyone. There are many options out there, but once you add the word HIPPA, the price skyrockets—not with LuxSci though. We made a good choice."